Today I decided I was going to be brave, and actually use the make-your-own-cushion kit that I purchased from Missha a long time ago. It’s been sitting on my desk, waiting for “the perfect foundation that doesn’t already come in a cushion”, and let’s be real: I’ve already got a bunch of cushion foundations that I really like, so I’m not going to spend lots of time trying out non-cushion varieties. What I would like, though, is a new blush. 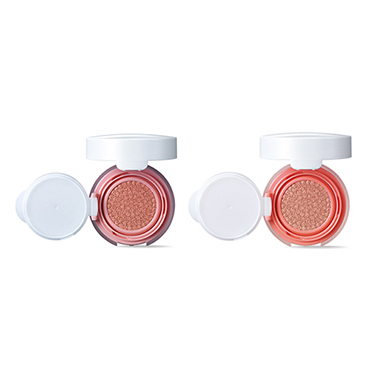 And not just any blush, but the one that caught my eye was IOPE’s Air Cushion Blusher. 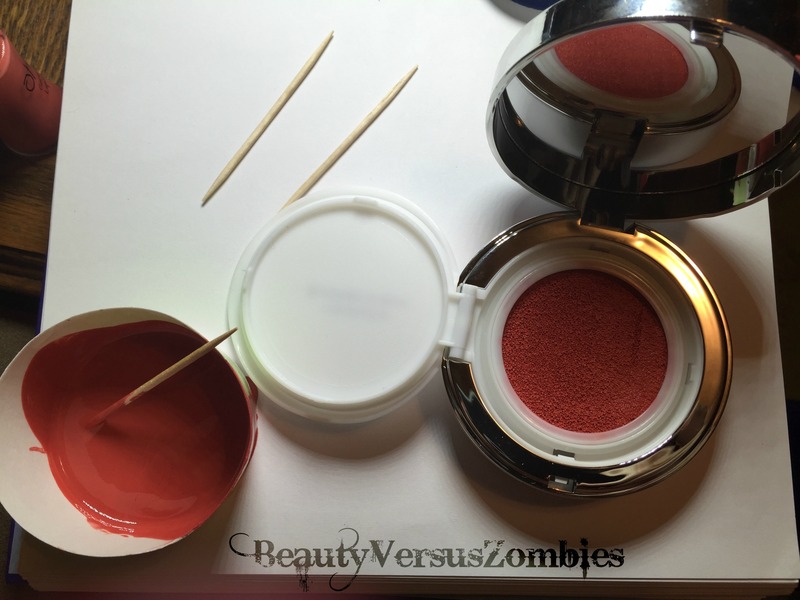 On the other hand… I am not particularly thrilled about spending $30 on a blush. So what to do? Clearly, the answer is to try and build my own cushion blusher and see how that works! First, of course, is Missha’s Magic Cushion Case. This case is a standard cushion case. 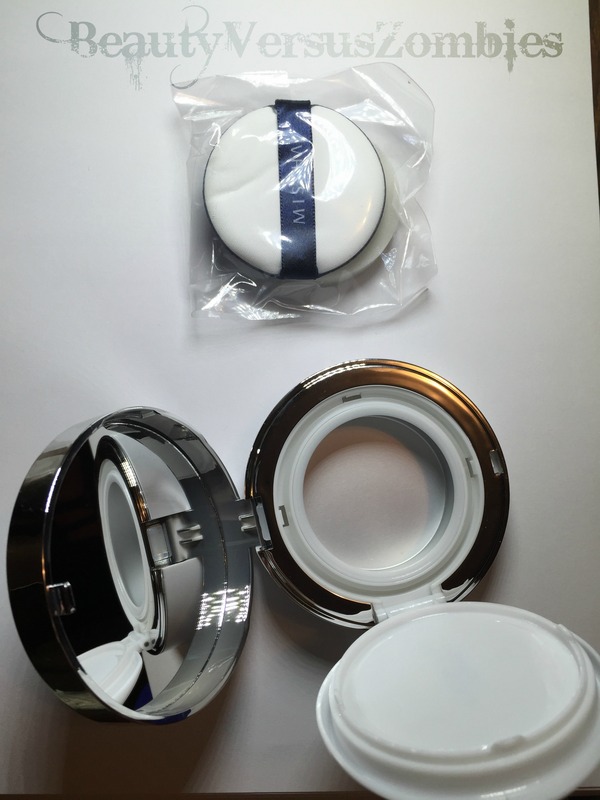 It has a mirror in the lid and a tray to hold the applicator away from the contents of the compact. 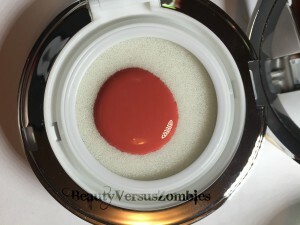 It comes with a sponge for the inside of the compact and a puff for application. The base product will be Mizon’s Oh! Shy Gorgeous on Liquid Cheek. This is a liquid blusher, like the product name says, and it comes with an applicator like the ones you find in a bottle of nailpolish. The product itself is watery, and extremely pigmented. This bottle contains 8mL of product. That’s less than then 15mL capacity of the case, and since the product itself is so strongly colored, I’ll add in other products. 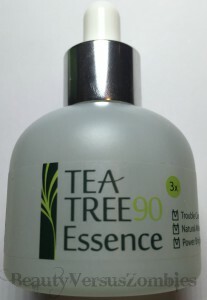 We’ll start with two droppers of LJH’s Tea Tree 90 Essence. I already know that this doesn’t make my skin angry, so it’s a safe enough product to add some volume to the blush. But I don’t want to water it all the way down and make the formula super weak, so I’ll also add in something else too. Here, let’s put in a little of Mizon’s Snail Repair Gel Cream, because SCIENCE! (Also to thicken it a little bit.) 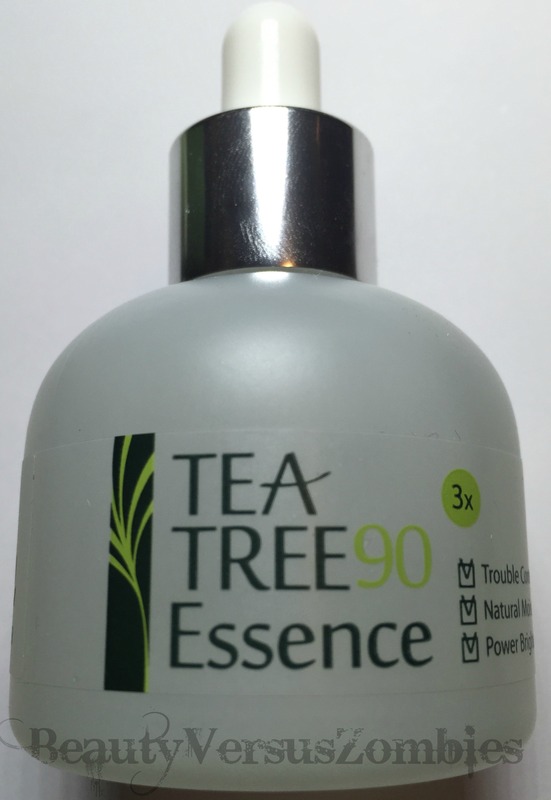 This is another product I’ve been using long enough to know that it won’t irritate my skin. Throw it all in a cut-down paper cup to mix things around. That looks gross. Three different consistencies all in a cup. Anyway, I’ll mix it with the toothpicks to make it uniform, since I don’t want to end up with a blotchy product. Adding the extra products has lightened the blush up a little, and maybe made it a tiny bit glossier, but I still like the end product. Now I’ll put the sponge inside the empty cushion and pour the blush onto it. Whoops. It didn’t move. Luckily I hadn’t poured all of the mixture out in one go, so I was able to pour a little ring around the outside and use a toothpick to smooth things out, ensuring a more even coverage of the sponge. You can see there is more product left than I anticipated – more than I thought might fit inside the cushion. I poured it back into the blush container in case things diffused through the cushion overnight and there was room for more – but when I pressed the cushion gently with a toothpick, enough product welled out that I feel satisfied that the cushion is full. 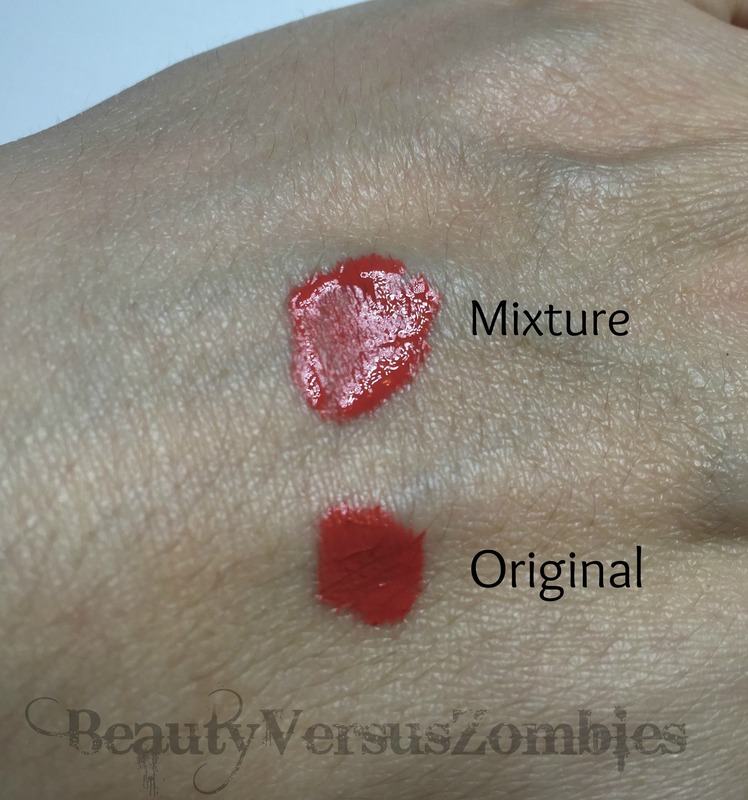 Despite the small change in the color of the product, it still goes on extremely pigmented, and a little bit goes a very long way! 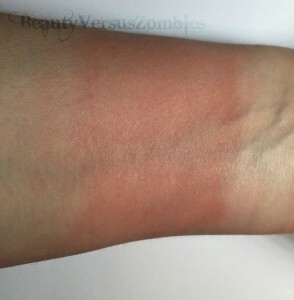 Here’s a swatch on my wrist. 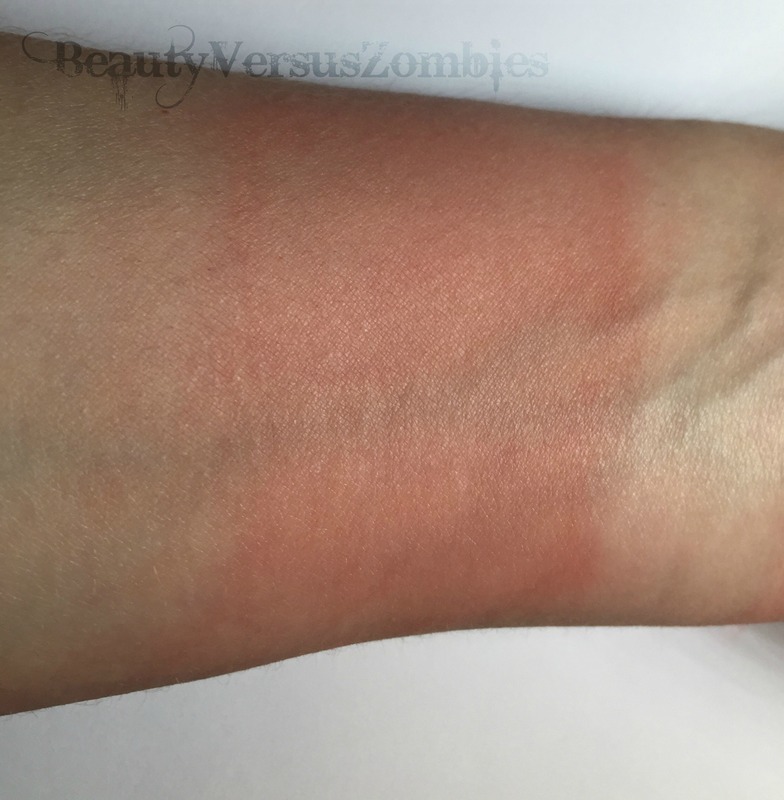 Pressing the puff into the cushion provided me with enough blush to basically cover my entire inner forearm. Clearly there’s going to be a learning curve so I don’t overapply blush every day, but I think that overall this was a success! You can buy the Missha cushion direct from Missha, or find it at most e-tailers shipping from Korea. 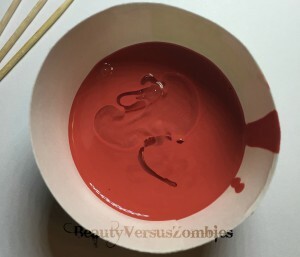 This entry was posted in cushion, DIY, ljh, makeup, missha, mizon and tagged DIY, experiment, makeup by BeautyVersusZombies. Bookmark the permalink.